Gibson F-5 #76553, Virzi # 10097, with fern peg head inlay, signed by Lloyd Loar and dated March 31st, 1924: pristine condition, flawless originality and unbelievable sound. We have been on a search for the ultimate mandolin for over half a century, and many, many original 1920s Gibson F-5s have come through our shop, but this one exceeds all expectations. The Holy Grail of mandolins has finally arrived!! First of all, it is from a special batch of the most sought after and highly prized mandolins in history. 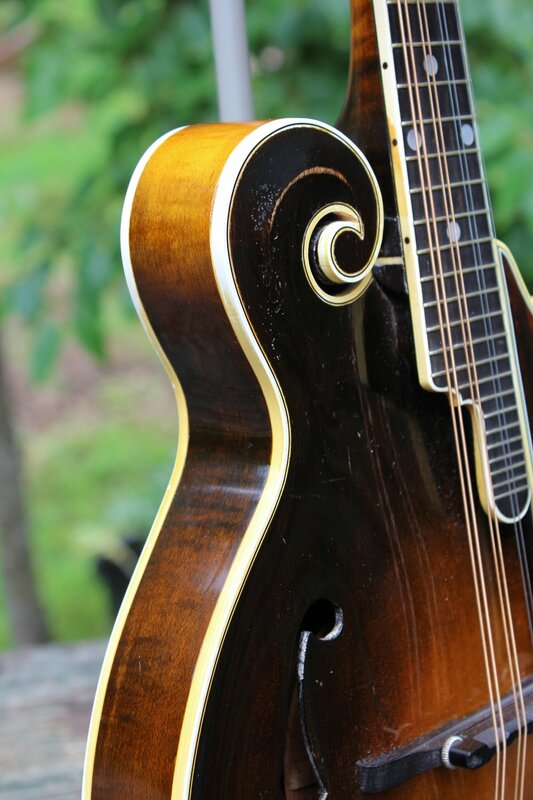 Less than two dozen of these fern inlay, white-binding Loar-signed F-5s are known today. Of those extant, many have had various repairs and restoration and sound quality also varies considerably. This mandolin, however, is in museum quality condition yet has the sound of a well played workhorse. There has never been an instrument to come to our attention that combines such perfect balance with power and volume to spare. Depending on how you apply the pick, the tone can range from rich, full, woody, deep, reverberant, majestic command to soft, mellow, clear sustain. Playing this one is pure joy, it is hard to put it down. (Anyone who has ever disdained the Virzi tone producer for any reason should spend an hour with this one: it will enlighten all thinking on that subject!) As to condition, there is absolutely nothing to discuss. It is just as it came from the factory in 1924, down to the pick guard attachment screw washer to the original frets. In addition to the aforementioned custom abalone pearl “fern” peg head inlay and white binding, features and appointments are consistent with factory specifications for this model and year and include the classic red spruce tap-tuned top and parallel tone bar construction with f-holes and long, one-piece slab-cut curly maple neck (which places the bridge in the center of the f-holes); back and sides of book-matched flamed sugar maple; headstock inlay of “The Gibson” in mother-of-pearl; pearl button tuners with notched endplate; hand-engraved tailpiece; pick guard following body points; silver plated hardware; and dark Cremona shaded-sunburst varnish finish. The original tuners, screws and bushings are original and in perfect working order, as is the pick guard assembly. As for playability, it is smooth and friendly, a nicely rounded neck that fits the hand perfectly. 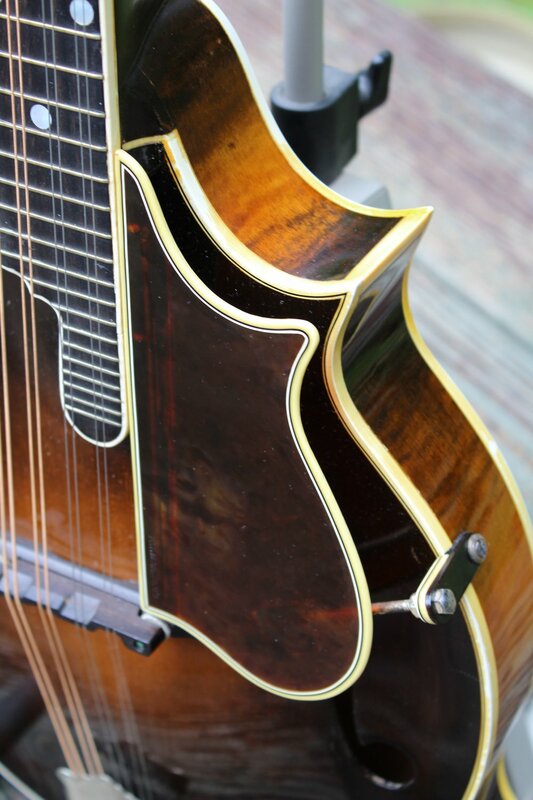 Most recently, world-renown mandolin builder Lynn Dudenbostel (the very master luthier that supplied Chris Thile with mandolins all through the celebrated Nickel Creek years) has fine-tuned the original adjustable bridge and truss rod to optimal function. 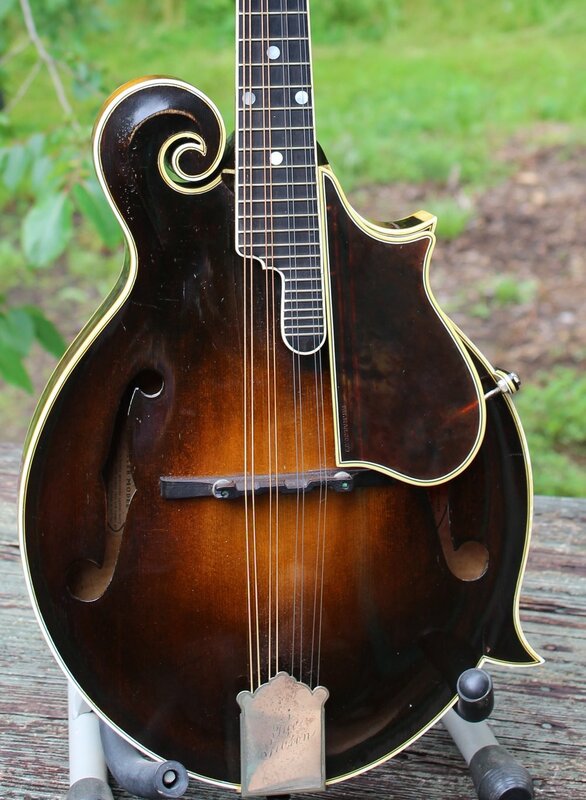 In short, there is no better opportunity to achieve ultimate mandolin perfection than this 1924 Fern-Loar F-5. Please inquire for pricing and showroom appointment to see and play this incredible instrument.